Hello. As you know the trend this week is a showing of cards with a flair of "blasts from the past". Voila was a stamp set that grew on me over time and then suddenly it was retired. I was so sad to see it go. I don't think I'm ready to let it go to MY retired list. I think I could sub a teddy bear for that cute chef in the same lay out. What do you think? Oh, now I need to order the Beary Best Friends stamp set (page 85). Do you see it? I think I might need everything on that page! 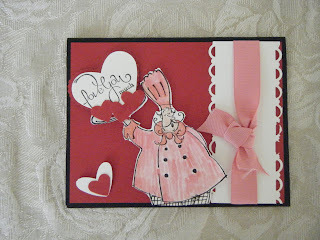 So let's get us some Stampin' Up cardstock, Black Stazon ink, Scallop Trim Border punch, heart to Heart punch, pink ribbon and some markers. Let's get stampin'! Ready, Set, Go!!! So good to have spent some time with you. See you soon and God bless you. This is a great fall to sketch for card making! I know I ordered Voila, but for the life of me cannot find it anywhere! Sheesh! Cute card. I never did get that guy and I've always regretted it. He's so much more versatile than I first thought. Great card. What a great card!! Thanks for sharing! Cute card! I love how you used the chef! What a cute design with mr Voila! Cute idea! This is so cute, I love the platter of hearts! !